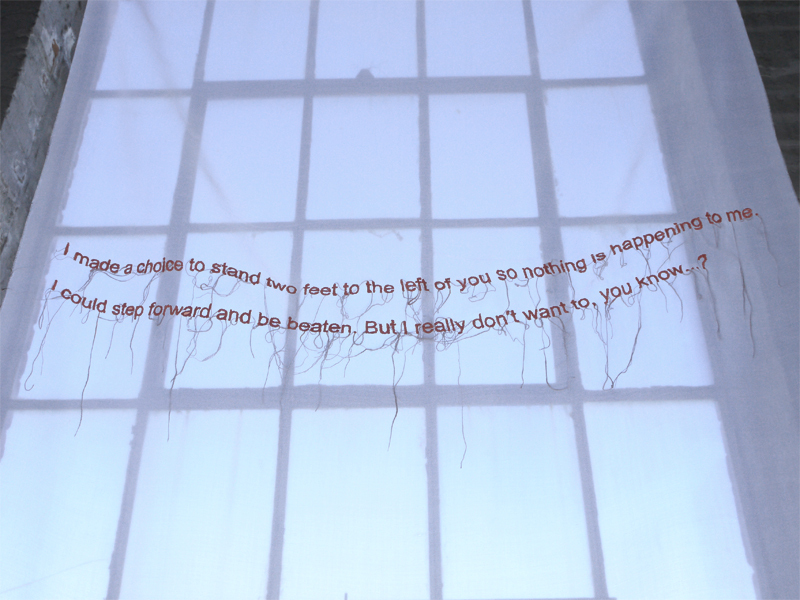 Bodies on the Line draws text from conversations with women activists from the San Fracisco Bay Area, my home at the time. The quotes used were originally selected in response to an exhibition space in Patterson, NJ—a town built on the manufacture of silk by a labor force of working-class women who put their bodies on the line at work, and in defense of better work. With silk thread on silk organza, I hand-stitched fragments of these conversation in order to intertwine the material and labor history of the place with the struggles of contemporary women. In 2016 I was invited to evolve the project for the Hangzhou Triennial of Fiber Art in Zhejiang Province, China—another city built on the production of silk.